Alaska's other high school football teams may be in mid-season form as they head into Week 5 of the season, but for the Dimond Lynx, the season is starting anew. Saturday afternoon's game at East High will be Dimond's first since the program was suspended more than two weeks ago for "inappropriate conduct" by some players during a mid-August road trip to Fairbanks. The Lynx missed two games and went nearly two full weeks without an official practice. On Thursday, two days before Dimond's first game in three weeks, new coach Derek Brewer worked off a written practice agenda. "It's a learning curve," Brewer said. "A new normal." Brewer was Dimond's head coach for four seasons more than a decade ago (2004-07), and last week he agreed to return as head coach when three coaches, including head coach Bernardo Otero, were "released from their positions" by the Anchorage School District. Brewer said he isn't reinventing Dimond football. The playbook hasn't changed from the start of the season, and several assistant coaches remain with the team. "I'm the only one who has to adjust," he said. "My assistant coaching staff is awesome, so I can focus on the administrative stuff and allow these guys to get back to what they do best, which is coaching." Beyond that, Brewer said, the game is the same as when he last coached, and it's the same as when the Lynx last played. "It's tackling, blocking and throwing the football," he said. "You never stop working on fundamentals. Even in 2005 when we won the conference championship I was never happy with where our fundamentals were. "Are their fundamentals behind? I don't know where they were before." Dimond was 1-1, with a win over Wasilla and a loss to Lathrop, before the suspension. The Lynx forfeited their next two games and are 1-3 heading into the game against the East T-birds, who are 3-1 and undefeated against Alaska teams. First on Brewer's written practice plan for Thursday: Calisthenics. Before that, he told players about parental-consent forms needed for a Friday "team bonding" meeting with Brad McCoy of the Texas-based Flippen Group, who the school district brought to town for a two-day training program for Dimond coaches. Students will be included in a portion of Friday's training. 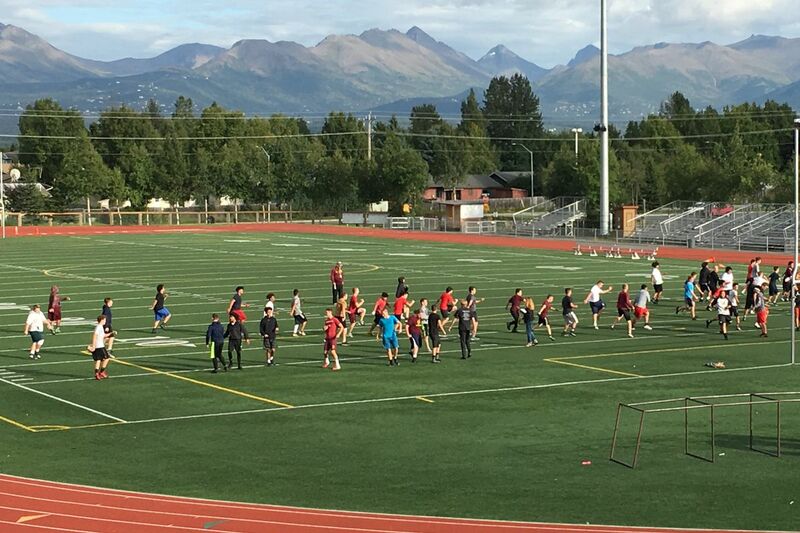 Brewer gave a shout-out to flag football coaches Kathleen Navarre and Brad Lauwers, who last Friday ran Dimond's first practice after the suspension was lifted. Navarre and Lauwers work at Dimond High, and although the school district prohibited contact between Dimond's players and coaches during the suspension, the no-contact rule didn't extend to flag football coaches. "They had a lot of positive action with the kids," Brewer said. "What they did was really powerful." Brewer said he was on the field for Dimond's first post-suspension practice, "and when I walked out here last Friday, I could tell they were ready." Then his eyes filled with tears and his voice broke. "They just want someone to love them," he said. "They're just kids. "They want security. They want direction. They want to believe in each other. They want to believe in something. "This thing that happened, it just really waylaid their trust."